If Spaceship Earth has taught us anything over the years, it’s to thank the Phoenicians for inventing the ABC’s that allow you to read this article! Thanks are also due to Walt Disney Imagineering for developing the attraction that taught us that, and many other facts, about the history of communication. Spaceship Earth opened with the Epcot theme park at Walt Disney World on October 1, 1982 inside a structure that was the first of its kind – a full geodesic sphere. The structure itself is an engineering marvel that took over 2 years to construct. Imagineers involved in the design process saw to it that there was an intricate gutter system installed between the 11,520 triangle plates to keep water from flowing off the side of the sphere, but rather diverting it into the World Showcase Lagoon. Have you ever noticed that there is a stronger breeze when you’re under the sphere than when you’re out in the sun? If the structure was placed too close to the ground, it would actually cause a wind tunnel effect! The attraction was designed to be at its precise height off the ground to keep that from happening. The ride within it is the first to be inside of a Disney theme park central icon. It’s an omnimover themed like a time machine taking you on a tour through the history of human communication. This particular track from the D-COT jukebox was added on September 8, 2008 (Happy 10th Add-iversary!) and features the current narration of Judi Dench. Since the attraction’s opening she is the fourth person to narrate for it, preceded by Lawrence Dobkin, Walter Cronkite, and Jeremy Irons. This particular version of the ride audio has been enjoyed by D-COT members for a playcount of 23,654. It has a weekly playcount of 32. Of our D-COT members, 199 have it on their Favorites playlist and our D-COT Supporters have added it to 33 custom playlists. All of the Spaceship Earth ride audios in the Jukebox have received high ratings. This one has a 4.9/5 average with 85 votes. As another D-COT Contributor, SEJ101, pointed out in one of his recent articles, this attraction has always had a sponsor since it opened – first Bell, then AT&T, and finally Siemens. Currently it has no sponsor which means changes could be around the corner. 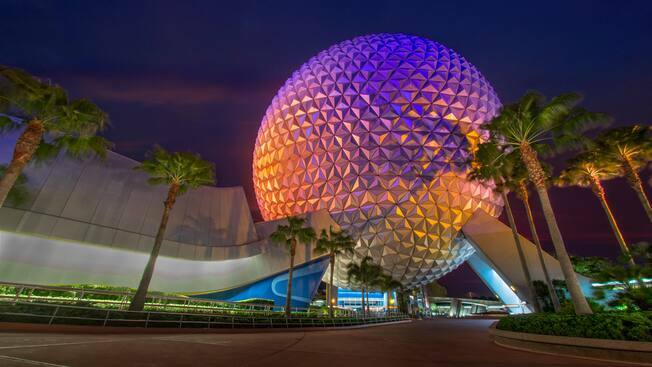 If you haven’t already, read his article, “Grand and Miraculous Changes to Spaceship Earth,” to find out more. See you in the future! Yay! This is the GREATEST attraction in all of Walt Disney World!! Thanks for the fabulous article this week!! Love this ride and the music that goes with it! Love the info on the “giant golf ball” as my nephew calls it! one of my favorite rides!! Although the Siemens sign is down, it still says it in the “design your future” video.